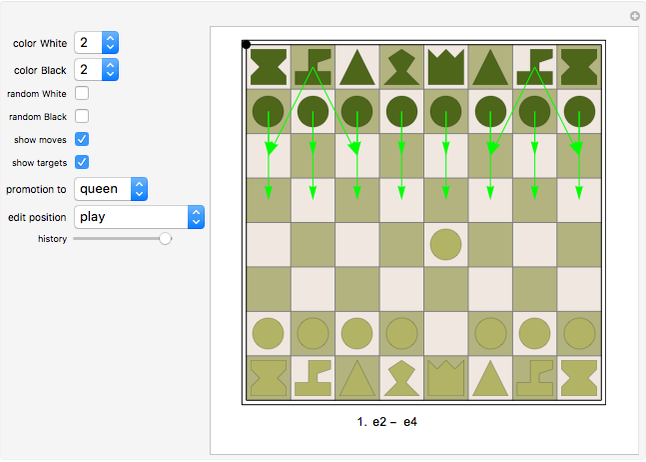 Basic chess game with optional board editing and history reviewing. You can only make legal moves. A small black marker on the left border shows whose turn it is. To make a move, first click the from-position (it will be marked) and then the to-position. If you click a from-position but change your mind and want to move a different piece, click the same position again. The "show moves" checkbox displays all current legal moves as green arrows, assuming no piece has been selected yet. Once you click a from-position, all target-positions will be marked green. You can switch this feature off with the "show targets" checkbox. The options "show moves" and "show targets" are temporarily inactivated while looking at historic moves. Set the option "random Black" to allow the Black player to make random moves. After your move for White, click the board anywhere to cause Black's random move. Similarly the "random White" option creates random moves for White. To promote a pawn, select the piece you want from the associated popup menu first. The last move by both sides is displayed at the bottom of the screen. You can look at all previous moves simply by adjusting the history slider. No chess moves can be made while historic moves are being viewed. You can edit the board at any stage in the game by using the editing menu. Select a piece type and then click the board to add such a piece. 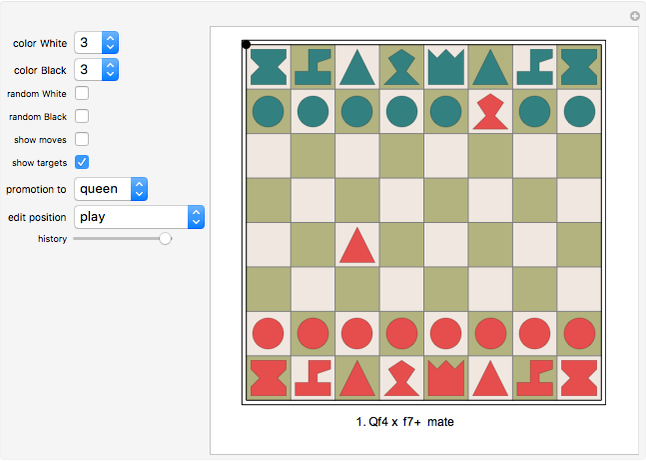 Select the "castling options" and then click a rook to switch a castling option on or off (green or red marker). Select the "delete" option and then click a piece to remove it from the board. Select the "clear" option and then click the board anywhere to empty it. Select the "reset" option and then click the board anywhere to recreate the original setup. The system will automatically go into "play" mode. Select the "next player" option and then click the board anywhere to change whose turn it is. This option is only available as long as no moves have been executed. 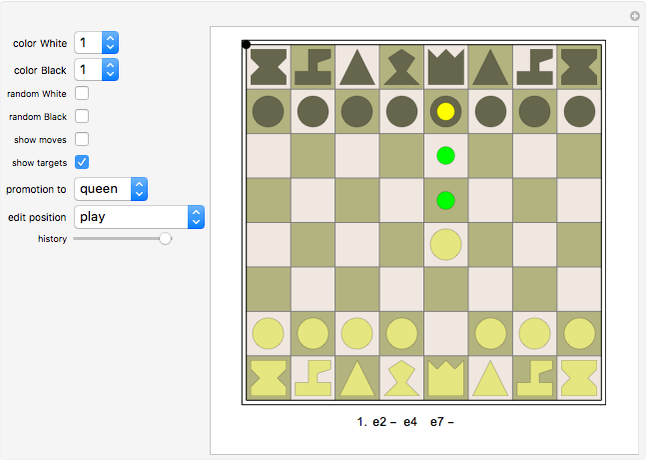 The option can be used for setting up chess problems with Black to move, for example.